Bagnoles Golf Course is a beautiful 9 hole course designed by Harold Becker in 1925 and situated in the middle of the Andaine forest. It is a very pretty, reasonably flat but physical course that dominates in the “doe-ford” glade. A river meanders through the forest and often borders the fairways. 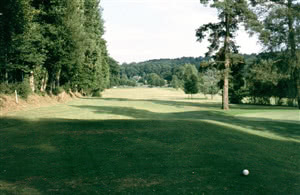 The total length of this nine-hole course is 2401m for a total par of 66 and a FFG slope rate of 120 from the back tees. The river presents a hazard on 7 of the 9 holes and with several out of bounds it is not easy to score well. The stags and deer that roam the forest could also distract you. Visitors are always welcome and, being situated on the edge of town it is easily accessible.